This tree is in blossom. It’s by the old London Wall. I cannot do it justice. You should go and look at it. Everyone should. It’s a miracle, in amongst the buildings. 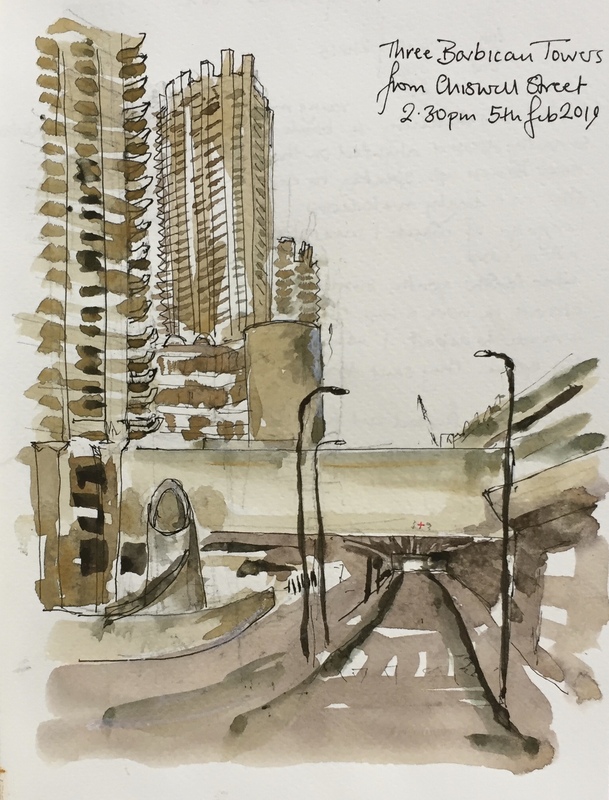 Here is a sketch I made yesterday showing Shakespeare Tower, the middle one of the Barbican Towers. I drew it sitting on a bench in Fortune Park. When I sat down, there was an agitated rustle under the bench, and a blackbird emerged onto the grass, looking rumpled. Another squawked among the leaves. I had the distinct impression that I had disturbed the creation of the next generation of blackbird. He, on the grass, squawked his annoyance at me. I offered crumbs from the rock cake which I had bought from Big John on Whitecross Street market. The blackbird accepted the crumbs, fluttered a little way away to enjoy them, but was not appeased. His mate, having adjusted her make-up, hopped out, and asked for some rock cake too. This picture took 1hr 15, drawn and coloured on location. Here is a picture I’d done 2 days before, from an extremely cold and windy position on Chiswell Street. From left to right, Cromwell, Shakespeare, Lauderdale. You see the infamous “Beech Street Tunnel”. This is an area of illegally high pollution levels, as the street is usually full of vehicles, and is covered. I haven’t shown the vehicles. Or the numerous pedestrians. The odd circular tower type thing on the left of the tunnel is the vent to the car parks below. It is an architectural feature. This was a much quicker picture as I was very cold and the location was busy and difficult to work in. 15 min on location and 15 min to do the colour at my desk.